Strong & Durable Waterproof Plastic Construction Bright and colourful UV Protected Ea..
Pilsan Western Hedge is recommended for 1 years and above age child. It measures 144 cm width by 144..
Pilsan Seesaw Age of Use 3 + Age Maximum Carrying Capacity 35 Kg Best Toy Funny Seduc..
For 24 Month And Over For Children. Countries to which they belong Brand: Turkey Pro..
Amazing beach set with a tipper truck ideal to play with sand. Age: From 3 years.Whethe..
Amazing beach set with a tipper truck ideal to play with sand. Age: From 3 years. Whether..
Amazing beach set with a tipper truck ideal to play with sand. It includes 2 sand cases of ma.. 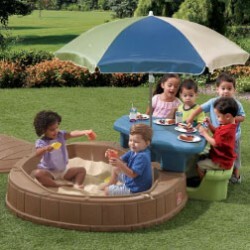 Features:Playhouse Dolu Toy Factory High Quality Indoor & Outdoor With Fenc.. Features: With flap door and 3 windows. 132cm (High) x 104cm (Wide) x 104cm (Lo.. Features: -With flap door, 3 windows, skylights and fireplace. fence 132cm.. Features: With flap door, 3 windows, skylights and fireplace. 132cm (High) x..
Good Stability for Kids Easy to Assemble & Easy to Store Designed for great stability S..